Astronauts on the International Space Station are going to beam into homes around the world during a live TV event this week. 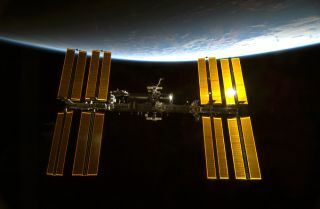 "Live from Space" — a live look at life onboard the space station — is set to air on the National Geographic Channel Friday (March 14). The two-hour broadcast will feature NASA astronaut Rick Mastracchio and Japanese astronaut Koichi Wakata speaking about their experiences living and working in space on an international team. "In their own words, learn how they sleep upside down, stay fit, maintain personal hygiene and, of course, (that question everyone is curious about), how they use the toilet," National Geographic Channel officials said in a statement. "To top it all off, we'll see incredible shots of our planet, from sunset and sunrise, to city lights and green aurora, to lightning storms and shooting stars." Viewers can also use the "Live from Space" website to enhance the experience of watching the program, according to National Geographic officials. As the station orbits Earth during the broadcast, the website will track it, displaying special information about the countries below the path of the station. The "Live from Space" program comes on the heels of the premiere of "Cosmos: A Spacetime Odyssey," another National Geographic Channel-affiliated show that focuses on the wonders of the universe. While "Cosmos" premiered on FOX Sunday (March 9), it also aired the following day in a premiere on National Geographic. National Geographic Channel will air the "Live from Space" broadcast in 170 different countries on March 14 at 8 p.m. EDT (0000 March 15 GMT). Check local listings.